Congratulations on being Dog of the Day. What a beautiful and big puppy. You have so much to learn with a family willing to teach. Greetings, Mia! Happy Dog of the Day! What a gorgeous young APBT x Tosa Inu you are, Mia, special in so many ways! But in no way are you more special than holding that coveted title of "first," and what a perfect first pup your human has in you ! You and she/he have only been together a short while, but already you've taken your rightful place in her/his heart! What fun your human is in for over the months and years to come, watching you grow and learn, the two of you sharing countless happy times, making memories to last for a lifetime! For now, it's clear you're keeping your family on their toes with boundless energy and your puppy mischief and antics, bringing immeasurable joy and laughter to their days! How lucky your family is, having a beautiful, smart, sweet and loving best furkid in you! You truly are a gem of a girl, Mia, beautiful inside and out, simply the best! Thanks for the BIG smiles, sweetheart! Meeting you today, seeing your heart-melting photos, has bee n a real treat! I hope you're enjoying a very special, fun filled and action packed day of celebration...being loved and pampered to pieces by your devoted humans, treated to all your heart desires and more! Lots of love, hugs and smooches to you, beautiful Mia, our very special and most deserving Dog of the Day, EVERY day! Dearest Mia, what a handsome young lady you are! You are only eight months old, a growing puppy. You are full of energy and make your dear people smile with all your antics. You're an emerging family member, keeping them very busy. You and they all love each other very much, don't you. What a wonderful love-filled home you share! 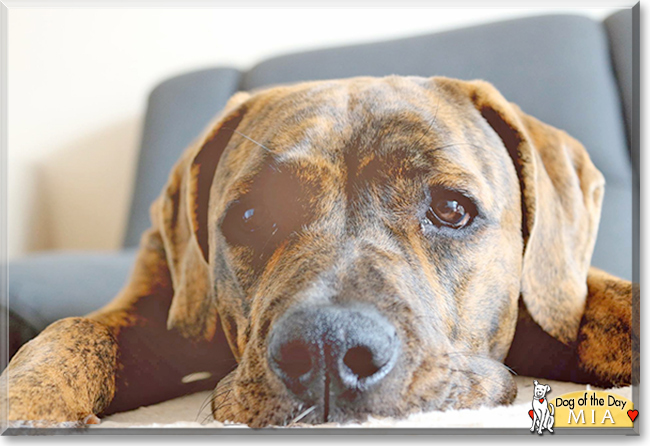 Congratulations, darling Mia, on being chosen today's Dog of the Day! We hope you and all your family and friends are enjoying a fine celebration, full of fun and lovies and all your favorite games and treats. Last edited by phesina; 11-07-2018 at 08:46 PM. Mia is the most magnificent and enormous puppy ever! I love her beautiful Brindle coat, what a superb DOTD! I sure hope Mia gets a lot of rawhide and chew toys, teething on them instead of furniture I am sure she will grow up to be even more beautiful and an excellent companion and priceless member of your family. Big cuddles to Mia please. Congratulations on being Dog of the Day, marvelous Mia!